In this evocative book, Angela Woollacott analyzes oral histories, workers' writings, newspapers, official reports, and factory song lyrics to present an intimate view of women munitions workers in Britain during World War I. 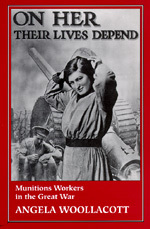 Munitions work offered working-class women—for the first time—independence, a reliable income, even an improved standard of living. But male employers and trade unionists brought them face-to-face with their subordination as women within their own class, while experiences with middle-class women co-workers and police reminded them of their status as working class. Woollacott sees the woman munitions worker as a powerful symbol of modernity who challenged the gender order through her patriotic work and challenged class differences through her increased spending power, mobility, and changing social behavior. Angela Woollacott is Assistant Professor of History and Director of the Women's Studies Program at Case Western Reserve University. She is the co-editor of Gendering War Talk (1993).